luggysgames18 has no other items for sale. Details about Mischief Makers N64 (Nintendo 64, 1997) Authentic! Mischief Makers N64 (Nintendo 64, 1997) Authentic! Mischief Makers Nintendo 64 N64 Authentic OEM Video Game Cart Original GREAT! N64 LOT ✨SNOWBOARD KIDS✨MISCHIEF MAKERS✨GOEMON'S GREAT ADVENTURE✨ USA - Rare! N64 LOT ✨Goemon Great Adventure✨Mischief Makers✨Chameleon Twist 2✨ NICE LABELS!! Space Station Silicon Valley Nintendo 64 N64 Authentic Video Game Rare OEM GOOD! Chameleon Twist Nintendo 64 N64 Authentic OEM Video Game Cart Super Rare GOOD! Micro Machines 64 Turbo BRAND NEW & Factory Sealed VGA 80 for N64 Nintendo 64! In Mischief Makers, you play the role of a robotic maid named Marina who is trying to rescue her kidnapped creator from an evil emperor. To do so, Marina must shake, smash, slide, throw, jump, dash, and ride her way through 60 side-scrolling stages in five different worlds. As you guide Marina through the game, you will need to collect gems to gain life and continues, utilize weapons, talk to various people, and destroy all enemies who get in your way. 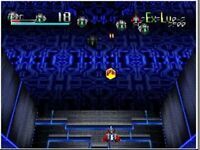 Unlike most 2-D platformers, Mischief Makers challenges players to use their heads to avoid obstacles and solve puzzles. Can still remember the first time I played this game back in The Nintendo 64's hay day. Great game, keeps you interested.